To me these homes are absolutely beautiful, I love their harmony in the design and their curves. The structures can easily, and inexpensively, be built in areas where little money is available and where there has been a disaster. Basically all you need is dirt and minimal supplies. They have created small emergency shelters that can easily be built almost anywhere, and have been used at UN Refugee camps in Africa. 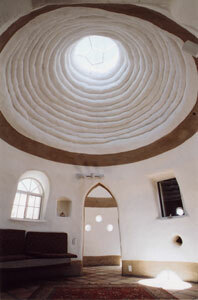 There is also an Eco-Dome, which is a small house, about 400 sq. ft. that has a central area and four niches that can be a kitchen, bathroom, bedroom, closet and a wind niche. 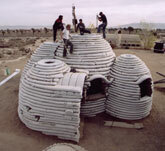 The design also lends itself for a studio, guest house or a part of a larger colony of Eco-Domes. At Cal-Earth they are working on a prototype three bedroom home that looks incredible-I’d be happy to live in it. On the Cal-Earth web site they explain that Superadobe is a patented system (patent #5,934,027) at the service of humanity. It is offered free to the owner builder. To me that is inspired work that serves others. The institute offers very hands on workshops to learn how to build these intriguing looking structures. They also sell materials for building and DVD’s on how to use them. I would love to do a workshop. Perhaps that will come when we really hit the road, cameras rolling. This is definitely one smart life way that could make a huge difference in how we build, use materials and even relate to one another. There are so many possibilities to do things differently from the way that we have been doing them. It feels as if with all that is happening in the world today we are starting to take a long and serious look at some new options. It’s time to stop making ourselves sick with toxic materials all around us, especially in our homes, and stop pillaging the earth so that she can recover from all that we have done. If we are to have a future that resembles the present our resources need to be used with more wisdom. I would encourage you to read About Khalili and also About Rumi-you will be inspired. 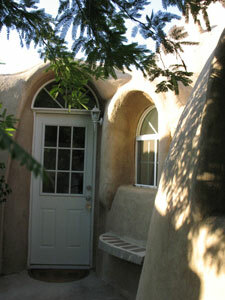 It is no wonder that these houses from Cal-Earth show us one way to be wiser.